Our Enterprise Barcode Printing Bundle includes industrial grade high volume Tabletop Thermal transfer label printer, USB cable to connect to a PC, Bluetooth cordless 2D imager USB barcode scanner, and BarTender Enterprise Automation label design and print software. Printing media (labels & ribbons) are not included in this bundle. Media needs can vary greatly- please contact us for assistance selecting the best media for your application. 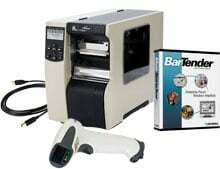 Bundle includes industrial grade Zebra label printer, USB cable, Bluetooth 2D imager and BarTender Enterprise print software.